Training for the student/instructor, or employee/employer. Creating top results at school and/or in the work place. Try to limit yourself to one lesson per week and take time each week to apply the lesson to your life. Do you remember one time in your life that someone believed in you? Maybe no one else did, including you, but someone did. This resulted in you believing in yourself and going on to make the achievements that you made in life. If you have never had this experience, I challenge you to look inside yourself to explore, discover, and unlock what may be hidden within you. If you have had this experience, I challenge you to be that person for someone else. Zig Ziglar talks about good finders. People that find the good in others. Zig gave the analogy of gold mining. You have to go through tons of mud to find a little gold. Therefore, look through other peoples faults to find that little bit of good and help strengthen that quality that they have. This is the bottom line. It all comes down to you. If you did not have someone help you build confidence in yourself, don’t use that as a crutch in life. You can not go through life blaming failures on him or her or what did not happen in your life. To be successful in life you need to learn to make things happen with or with out the help and support of someone else. Better yet, if you want to be a good leader, you need to be that person that helps find the good in others. That is what produces top performers and champions in the workplace. There are many people that have went through life never discovering or claiming all of their talents in life. Perhaps they feel cheated in life because they did not get the support that other people got. Or maybe they go through life always looking for someone to blame for all of their faults and failures. Well, I hate to be the one to break it to you, but life is not always fair. You must deal with your situation and overcome any obstacles in your path. You are really the only person in control of your success. It all start with you. 1) As a student or employee it is important to overcome all of lifes challenges. I encourage you to stop accepting meritocracy, stop blaming others, and start exploring, discovering and claiming everything life has to offer you. 2) As a manager or teacher it is important to help each employee or student discover their talents and abilities. Whether you know it or not, you are a huge influence in their life. They are looking up to you for direction and leadership. You can the help them achieve success, but you also have the ability to help feed their excuses of why they can’t succeed. You can contribute to being a positive or negative influence in your employees or students life. I encourage you to be a good finder. If you do this, could you imaging how successful your students may become? Or how successful your business would be? This is what will take your business to the next level. As a student, manager, leader, entrepreneur, or employee; take some time this week to think about what abilities you may have. Has anyone ever complimented you? Have you ever noticed that you’ve done something well? What are you passionate about? 1) Once you’ve discovered an ability that you have, post the talent you have to the comment section of this blog or email it to me. 2) Think of one way that you can use and strengthen your talent this week. 3) Do you see a talent or ability that one of your students, employees, children or spouse have? Give them a pat on the back then support and encourage them. Please post below or email me your results from this lesson. This post ties to the last post about unlocking your hidden talents and skills. We are going to expand on this topic this week, then we will move on to other topics. We’ll also discuss how you need to keep an open mind and be willing to consider new things, and the last thing will be about the times you must face your giants (challenges in life) before you can overcome them. First, lets talk about helping others unlock their talents. You do not have to be trained, have a fancy degree, be rich, or anything else to inspire someone else. If you go through life looking for the opportunity to make a difference in someone’s life, I guarantee you will get your chance. Please note in the video, there was nothing special with the guy at the gas station. He was an average person with no special training. However, he was able to connect with the kid and make a difference in his life. Second, always be willing to learn from others. It’s like going to the grocery store. You plan to buy something or you would not have driven there. So you don’t want to come out empty handed. However, you certainly do not want to come out with everything in the store either. You walk through the store getting the things you need and leave the things you don’t need on the shelf. Life is the same way. We need to listen and be open to all ideas and use what you need. If you don’t need it, leave it on the shelf. If the kid would not have listened to the guy at the gas station, he may not have ever unlocked his hidden talents. Watch lesson 2 video before continuing. 1) Everyone needs to be willing to learn or keep an open mind. If the boy would not have accepted the guys advice, he may never faced the bully and overcame his fear. 2) Everyone will have many challenges to face. It is necessary to face your challenges to overcome them. I have a quote that I like to use which is, “Challenges Produce Champions.” In the story in this lesson; this quote makes a lot of sense as Carols did become a world champion. You must face and overcome your challenges as well if you want to become a champion in the workplace. If you are a business owner, manager, or teacher, this lesson has another point to consider. You don’t have to be trained, have a fancy degree, or have a lot money to make a big impact in someone’s life. If a gas attendant can make that big of a difference in a little boy’s life, how big of an impact can you have with your employees or students? If you reach out and help someone become a top performer; this will benefit your company or team as well. Who would not want top performers on their team or company? If you still have challenges that you need to overcome, I challenge you to face them and determine how you can overcome them. Take some time this week to reflect on your life to think of something that may be holding you back from being the person you really want to be. Once you identified the challenge, determine why you are afraid to face this challenge. Many times you will realize the reasons for fear are not really that significant. For example, you may be afraid of what people will think. First of all, who are these people. If they are your family or employees, they should support you. If they are not family, friends, or employees, who cares what they think in the first place. Many times we may not really even be able to identify who those people are. Therefore, overcoming your fear becomes quite easy as you realize that all of your fears were false. If you still have a fear, determine if overcoming the challenge will make you more successful in the end. 1) Think of a challenge in your life and think of a way to overcome it. Please post your challenge in the comments section or email it to me. As a manager, teacher, or leader look for opportunities to help others. Look for talents and abilities in others and reach out to help them discover and strengthen the talents. The more people you help the more successful your company or team will become. 2) I’m sure that you have already made a difference in someone’s life before. Reflect on how that made you feel and leave us a comment or email me. Continue to look for opportunities to help people succeed. Because when they succeed so will you. One Last Video Clip That You Need Watch. I Am A Rocky Fan, Whether You Are Or Not, This Is Very Useful Advice. We’ve spent a lot of time at the baseball park this year. Our twin boys play, luckily they’re on the same team, about twice a week. They are doing good this year. I believe that they have won 7 and lost 2. One of the problems many of the kids have is striking out. However, not because they are swinging, but because they don’t swing; they watch the ball go right by them. I hear the coaches encourage them to swing. If you make a strike by swinging, it will be all right. However, if you don’t swing, then it is certain that you will not hit the ball and have a chance of hitting a home run. One of the best known players of all times is Babe Ruth. He is known for his extremely high record of hitting home runs. However, you may not know that he struck out more than most players as well. He realized that if he plans to hit a home run, then he must swing the bat and give it his all. The lesson in baseball is to take the risk or chance and swing the bat. You may strike out, but you may make a home run too. Fun Fact: Babe Ruth struck out 1,330 times and hit 714 Home runs in his career in 8,399 at bats. The same lesson can apply to business success. I think as a kid, we become scared to take risks. (if I swing I may strikeout!) It’s safer to not take chances and we grow up afraid to take risks. It is easier to stay in our comfort zones and “walk” or coast through life. However, the risk takers, shakers, movers, and people that can think outside of the box, are the people that can achieve the greatest (home run) success. • Baseball – Don’t swing at everything. A good ball player knows when to swing and when the pitch is not worth swinging at. • Business – Don’t jump at every opportunity or deal – Make sure the opportunity or business deal is a good investment, a good decision and worth your time and effort. There are a lot of bad pitches and bad business deals or scams out there–be careful. • Baseball – You must keep your eye on the ball if you plan to hit it. By taking your eyes of the ball, your chances of hitting the ball are slim. • Business – Stay focused on your goals, purpose and the mission of your business. Focusing on too many things or things that will not benefit your business will limit your success. Determine what is important and don’t allow yourself to focus on anything else. • Baseball – When the pitch is a good one, SWING! If you don’t swing, then it’s certain that you will not hit the ball or make a home run. Don’t worry if you swing and miss. If it is a good pitch, then it will be a strike anyway. Go out swinging! • Business – When you determine that there is a good business deal go for it. Timing is important to being successful. Hesitation or procrastination will lead to many missed opportunities. There are no guarantees in life, but you will never be successful if you don’t try. In baseball and in life, I think the key point is to do you absolute best. Do your best at all you do. Whether at work, baseball, homework, or whatever; do your absolute best. Just like Bake Ruth, he gave it is all. Here is a mentor of mine, Chip Foose, that is giving his advice to students at a college career day. I believe is some the best advice you will ever hear so be sure to watch this video. 1) Reflect on a time that you saw an opportunity and pursued it. You may have succeeded or you may have failed, but leave us a comment or email me your results. 2) Think of a time that an opportunity presented itself to you and you reclined to pursue it. Was it a wise choice now that you look back at the opportunity? Share with us. Are You A Good Manager Or A Good Leader? A study at Cornell University’s Johnson Graduate School of Management found that compassion and building teamwork will be two of the most important characteristics business leaders will need for success a decade from now. Managers and leaders are very similar in many ways, but they have different ways of accomplishing the same goal. Some managers are also excellent leaders, but there are some outstanding managers that do not possess the leadership skills. Let’s take a minute to differentiate the two. Both leaders and managers have followers, but the leaders followers, follow by choice while the managers followers, follow because they must obey the manager. Managers do things right by following the book, while leaders do the right thing by their own intuition. Managers are more likely to work their way up the corporate ladder with experience and hard work. Leaders may shoot to the top with their enthusiasm, direction and vision they have for the company. We need a mixture of leaders, managers and followers to be successful. Leaders give direction, managers execute, and followers do. Therefore, the ability to be able to utilize each skill when needed is the key. An example of a good leader is Martin Luther King. He had many followers that believed in him and his endeavors. I’m sure all of us have watched one of those cop movies where the cop goes outside their boundaries, uses “outside the box thinking,” and may even get suspended for doing the right thing. They always get rewarded and become the leader and hero of the movie. You may be asking yourself, who are the followers? Well, everyone watching the movie is counting on the cop to do the right thing. In reality, we may not always come out the winner being a good leader. The movie Freedom Writers is a true story about a teacher that uses her leadership skills to earn the trust of her students; however she was not very well liked by her co-workers and was constantly challenged by her endeavors. However, she reached her goal of connecting with the students. She knew what her goal was and had to stay focused to achieve it. A good example of a good manager is Donald Trump. I don’t know his bio, but according to personality on “The Apprentice” he is a good manager. His followers follow him because he is “Donald Trump.” If they don’t follow him; “You’re Fired.” I am sure he has some leadership skills to get to where he is, but I think management is his stronger side in my opinion. It’s easy to see with all his possessions that he does things right in the business world. Two names pop into my head when I think of someone that possesses both leadership and management skills. They are Bill Gates and Sam Walton. These are two corporate giants who must have good management skills to get where they got and was/is liked and respected by many people. I think we all can portray some of both qualities. However, we are probably naturally stronger or better in one area than the other. For example, you may be a good leader, but have issues executing the task at hand. Therefore, more attention to your management skills may be needed. I think it is important to discover our natural abilities and improve our lesser abilities to become great managers, leaders, teachers, or parents. Everyone can become a great manager and leader. However, you are naturally stronger on one of the two styles. The key is to identify your natural abilities and develop you lesser abilities. Determine if you are a stronger manager or leader. Do you do things right or do the right thing? Do people follow your lead because they have to or because they want to? Are you better at giving direction to a project or executing the task at hand? 1) Once you have determined your stronger ability, please leave a comment in the comment section of this blog or email me which one it is. 2) Then list one step you are going to take to improve your lesser ability. Please share your results so we can all learn from each other. 3) Think of all the presidents that we’ve had on history. Which one was the best leader? Which one was the best manager? If you have not heard of the movie “Freedom Writers”, here is the movie trailer to it. Great movie, I recommend it to you. I recently started reading a book titled “Co-Active Coaching.” This book was written to help coach people towards success in work and in life. I’ve already read a few parts that I would like to share with you and expand on. I believe that some of the methods mentioned in this book can be used for coaching, teaching, and even building your business. The first thing that caught my attention was this, “The coach does not deliver the answer; the coach asks questions and invites discovery.” This method of coaching allows the agenda to come from the employee or student, not the coach. The coach helps the employee or student to reach their goals by helping them discover and achieve their own goals, not the goals of the coach. This allows each coaching session to be tailored to the each employee or student’s needs. In education, we may say it like this, From the sage on the stage to the guide on the side. In other words, turning your learning environment from a teacher led to a student led environment. The teacher led method has been used for many years, which is the teacher giving all of the lectures and the students listening and memorizing the material. However, many times the students learn the lesson long enough to ace a test, but forget the material shortly after. The student led model allows the instructor to force the students to lead, which requires the students to engage in the lesson and search and discover how to learn the material them self. The teacher is now more of a facilitator, which helps guide the students in the right direction. This allows more room for interactive and discovery discussions in the classroom. Building Your Business When building a business you can use this method to build your team. You may want to build your business a certain way, but that does not mean everyone will want to do it exactly the same way you do. Just because I like to blog, does not mean that everyone will want to blog to market their business. Therefore, spending hours teaching them to blog is useless. They may want to use twitter to market their business. Therefore, time would be much more effective helping them with twitter. If you’re a business owner, have an open mind. If the employee is achieving the desired end result, let them do it their way. Remember, there is always more than one way to get from A to B. I would never want to jeopardize quality, but if the end result is to your satisfaction, give them a little slack. You may be surprised of how productive your employees may become if they feel that they use their talents and abilities to contribute to the success of the company. The main point of this lesson is to focus on the person you’re helping and not your own concerns or agenda. This may not work in every instance, but knowing when to lead and when to listen and direct or point someone in the right direction is the key to being a great coach, leader, manager, or teacher. 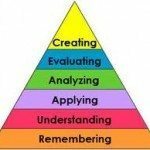 Learning involves levels. As you can see in the diagram, memorizing something long enough to do well on a test is just level one learning. At this level it is necessary that the manager or teacher give direction and tell them what needs to be done and how to do it. After repetition of doing the job or task the new employee will start to understand why they are doing it the way you instructed them. This stage still requires direction and supervision. Then they will move into the applying and analyzing stages. in These stages the employee is competent, but still require a little supervision. The evaluation stage is where the may make a mistake, but he or she will be competent enough to figure what went wrong. (learn from mistakes) The deepest or last level of learning is creating. This is when you need to step back and allow your employee to create their own style. (no one likes to be micro-managed) Always be available for questions and coach them, but try to allow them develop their own way of getting to the end result. So when the employer hires a new employee, there will be many hats the manager must wear to produce this type of results. I guarantee you that effort and steps will pay you back in the end and allow the manger more time to do other productive tasks. 1) It is very easy to dictate and voice your opinions. However, spend some time this week looking for the right opportunities to listen at a deeper level and help someone by guiding them. Think of questions that that will help point the person you helping in the right direction. 2) If you have a method that is working well let us know about it. Let’s work together to produce the ideal employees. Please leave us a comment or email me your results. QUESTION…HOW WOULD THIS BUSINESS MODEL WORK IN THE AUTOMOTIVE INDUSTRY? Natural Born Leaders – Is There Any Hope For Me? I’m sure you’ve heard that there are “natural born leaders.” Does this mean that if you are not born with the traits (intelligence, self-confidence, determination, integrity, sociability; as described in the text “Leadership: Theories and Practices”) that you can not be a good leader. It is true; some people are born with qualities which make it easy for them to be a leader. However, this statement is not an absolute. Some of the people that have the abilities to be a leader don’t use their talents to do so. On the other hand I’m sure we have all witnessed a great leader that did not have any of the abilities mentioned above. What then makes leaders, leaders and followers, followers? Even though some individuals are “natural born leaders” we can all learn to become leaders. While it comes natural for some people by their traits, looks, or personalities; others can learn the skills to become effective leaders as well. They just may have to work harder to achieve the same results. For example, in school we see students that ace class without ever taking a book home and we see other students that ace classes struggling with late nights of homework. Same result, but different efforts to produce the same result. With that said, we don’t all have to be leaders. It takes a good mixture to make society productive. We need leaders to give the direction, managers to make sure it is done right, and followers to do it. If we were all leaders and agreed on the direction; there would be no results if there were no followers to do it. However, it may be necessary for us to change rolls according to our situations. For example, an employee may not enjoy being put on the spot, answering questions, or dealing with the public at work. They may simply like to show up to work, do their job, and go home. This employee would be considered a follower at work. However, when he arrives home he must become the leader to properly parent his or her children. So I think we must all strive to do our best in all areas of our lives in order to achieve our goals and dreams. Here is an article over the 5 traits of a leader that you may be interested to read. Lesson 6: We can all be effective leaders, but we must all be good and good followers in life. The key is to know when to lead and when to follow. Just like teachers, there are time we must become we must become the student in order to learn and stay updated with the latest trends and techniques. Assignment: Think of a time that required you to be a leader. What did you have to do to be an effective leader? What is one step that you can take to become a better leader this week? Please post comment or email me your results. Anything worthwhile takes effort. If you want to be a great leader, do the steps necessary to make it happen. I had the opportunity to hear Chris Gardner several years ago in Las Vegas. He is an example of someone that did whatever it took to become successful and a leader. I recommend that you take a few minutes to watch this video of him. You may need to set aside a little time as it will take some time to watch them all, but well worth it and help you you improve your skills and mindset. Have you ever watched American Idol and noticed the Coke cups sitting on the counter? Coke pays a lot of money to have their cups sitting there, but don’t you thing everyone already knows about Coke? Well, Coca-Cola knows how to brand a company and they understand the significance of keeping their product in front of their customers. Did you know that more people choose Pepsi in a blind taste test? However, when they can see the products more people pick Coke. This proves the power of branding. With this said, I encourage you to consider getting your name or company out there in front of people more. It has never been easier or cheaper to do than now with social networking. If you blog you may not to watch this next video. The video below shows you how to start our own blog absolutely free. Your lesson this week is to add a comment on this blog with your new blog. Or if you already have a blog, please leave us a comment with a link to your blog. Here is a video I found on MSNBC explaining how to use Twitter for your business. Welcome to the Final Lesson of this 8-week course. I hope that you found some value from the eight lessons. If you will apply the eight different lesson to you life, business or classroom, I guarantee you that it will help you succeed in business and in life. We covered lessons on self development, coaching, leadership, social media, and time management. Thanks Again For Completing The Business Success Training Course. Kudos To You My Friend. Now Go Put It All To Use.